Handmade tatting lace blog with my own patterns, tutorials, how-to and links to useful resources. It's all about my passion and my joy. I share here what I like and what works for me. If you've been following me, you know that I can change my mind from time to time, and feel free to comment that I'm completely wrong, you may be right. I'm not running a business. I'm not paid and have never received any compensation or facilitation for any review/brand/site here mentioned. In case one day we'll ever meet, I'll be the one offering you a cup of Italian coffee, too. I'm not joining the base of the down trefoil, that makes a curved edging but on the opposite side. As it often happens (to me at least! 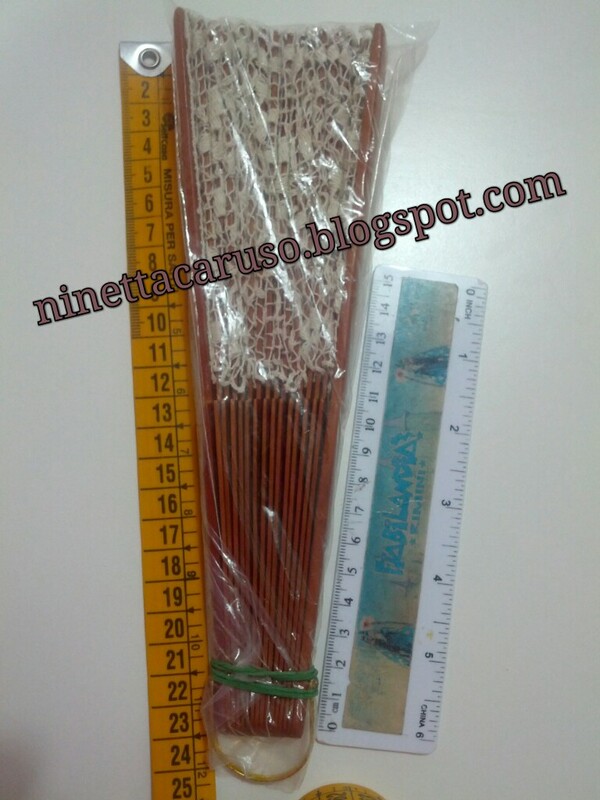 ), I began the edging without a clear picture of what to do, but now I think it would be nice for a fan. That's because Caterina, a lady in facebook, asked for help in finding a pattern for a fan and I'm very glad she asked because then I started to think about it. Thank you Caterina! Then, back to the edging. The colour would be perfect for a fan, but now I should think how to continue... I love tatting puzzles! I'm using a DMC thread, size 80, colour number 3778. The shape that I've drawn is based on a fan's dimension of 23cm long from rivet to leaves and 10,5cm sticks from rivet to lace, the shape must be a little bigger to let the lace fold when closed. This shape has already been "tested" with the fan I made in filet lace. Squares in the paper are 4x4mm, paper is a piece of a large notebook, a little bigger than the A3 paper size. Also, remember that the lace stretches a little. The vintage pattern asks for an inward-facing picot, even if it is not mentioned in the written text. A inward-facing picot is also called drop picot or clip picot or down picot, it is a picot made with the core thread. 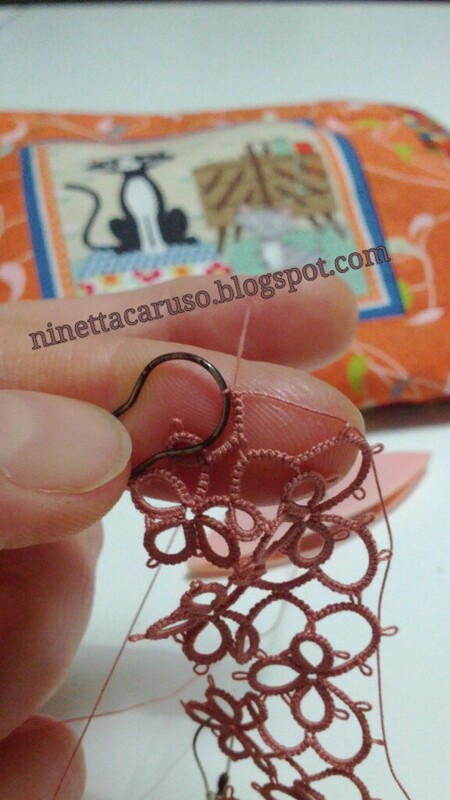 I'm tatting the chains in "direct method tatting", that is tatting reverse stitches, not flipped, like in the second side of a split ring. I wondered how other tatters have made it and then I googled about it. 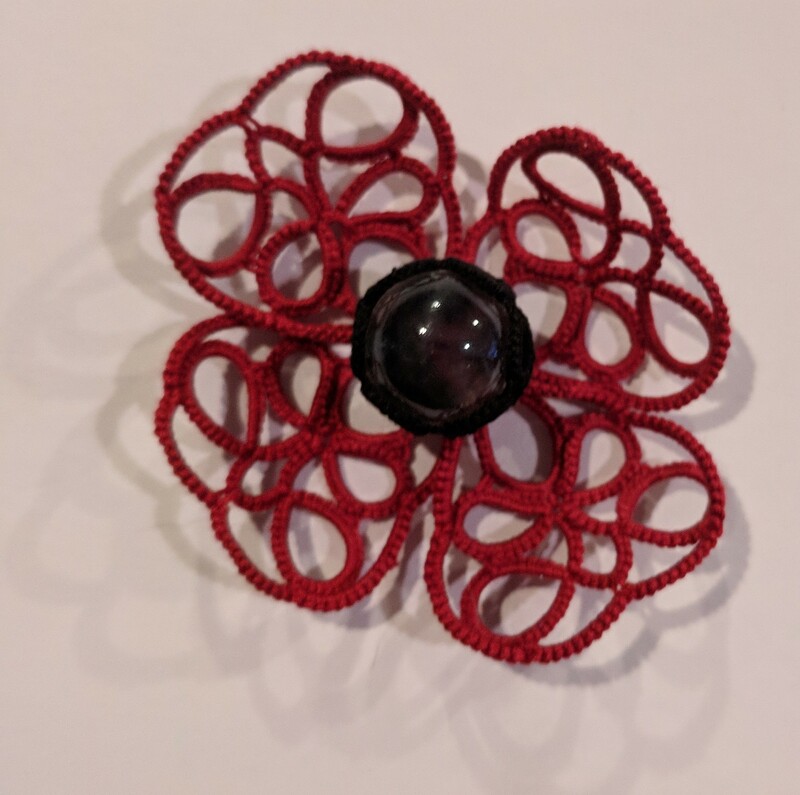 I found something actually, but nothing about inward-facing picot in direct tatting. There's not a great difference, of course I use a pin like in the normal way, but if you please, I put a video in my channel, that is me tatting that picot. There are fan's patterns in "Mani di Fata" issue 9 and issue 14, too. Direct tatting is like encapsulation (http://www.georgiaseitz.com/2003/encap/encap.html), ds are not flipped, they are reverse stitches, for example the second side of a split ring is direct tatting. See also Frivole's last video about the "magic loop helper", where she shows how to tat reverse stitches unflipped on a chain. I look forward to seeing your fan, it's going to be wonderful. There are some lovely fans out there, thanks for the links, they make me want to tat a fan! Il problema di un ventaglio fatto a "strati" orizzontali è che, volente o nolente, o archi o anelli resteranno sulla piega, per cui chiuso resterà troppo ingombrante. Secondo me un ventaglio a chiacchierino va fatto a "fette" verticali. A meno che l'obiettivo sia fare un ventaglio da esporre, da non chiudere. Oh, your video is so helpful! Thank you! I used a starter picot on a reverse chain and uploaded a pictorial pdf, too (June 2017 - 'another colour dilemma') if you wish to check it out. 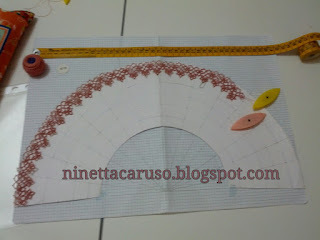 Another method of inward/drop picot is something even you have done as in your dimple rings! Shouldn't you add a link to it ? thank you! :-f (I read all your posts!) you're so kind, yes I agree there's much more to say about inward picots d( but in this post I tried to talk only about the joining picot made with the core thread. Dimpled rings? :-? Idea of tatting only last round as edging is great! I like it. Thank you Alka and welcome! Thank you very much for all your nice comments. 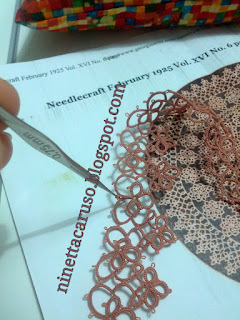 start the world web tatting tour! Tatting and not a lot else! 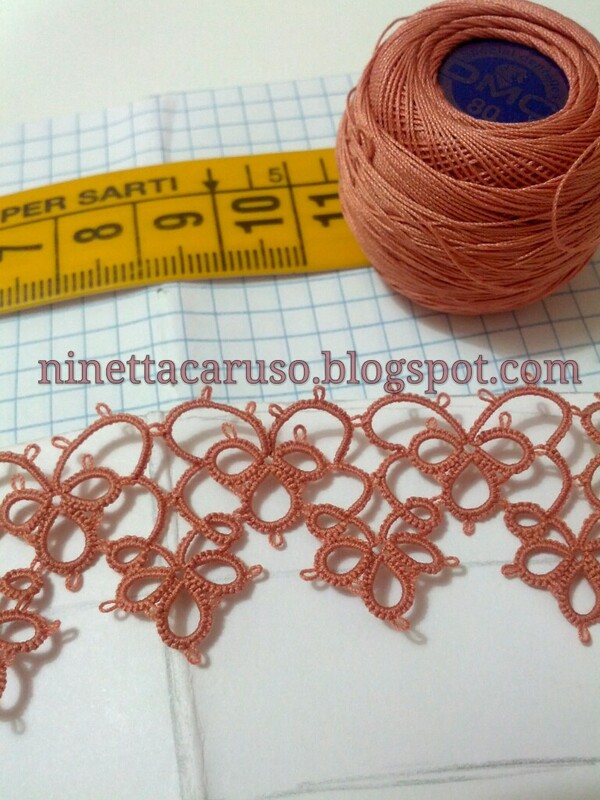 Tatting: We make lace with lots of little knots! Creazione per il 5°concorso "Creatività a chiacchierino"
Orecchini eleganti blu e argento !! Instagram 500 Follower Christmas Giveaway!